Very Cool! I also prefer to develop my code, hardware, etc from start to finish even though it may be inferior. It is a tremendous learning experience. I thought I mentioned this before. With your single-axis segway if you turn around on a ramp it will cause some issues due to the coupling of yaw, pitch, and roll. 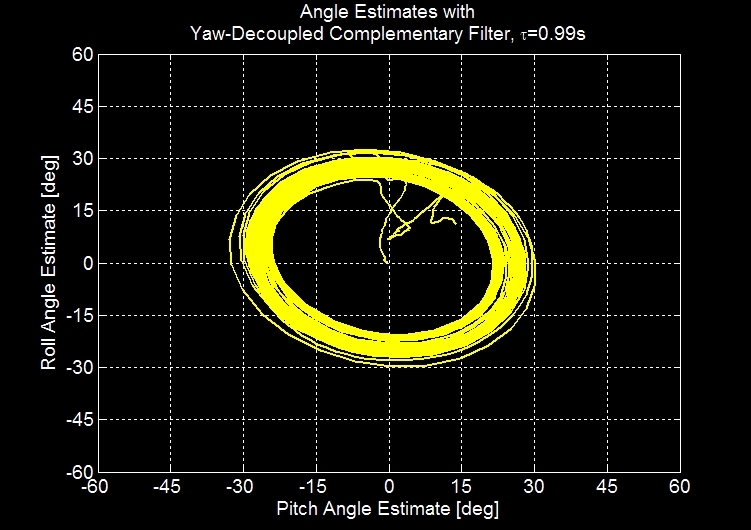 In order for your pitch estimate to remain unchanged, your angle with the surface normal must not change. On a ramp, your angle with the normal is not the same as your angle relative to gravity. That's true. The single-axis self-balancing stuff I've done doesn't assume a 6DOF sensor, so it can work with one accelerometer and one gyro signal. 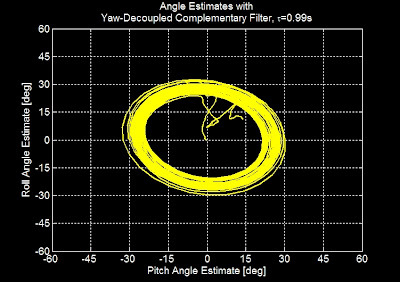 In that case, it's up to the complementary filter to correct for the yaw coupling, albeit slowly. Good Idea. One thing I don't quite understand though is where exactly the INV_RAD term comes from. True, I didn't explain that at all in the post. INV_RAD is a constant that is equal to (pi/180). It scales the pitch/roll angle, which is in degrees, back to radians. The cross-coupling term is then scaled by the angle, in radians. Why are you converting to radians when int_pitch or roll seem to be measured in degrees? 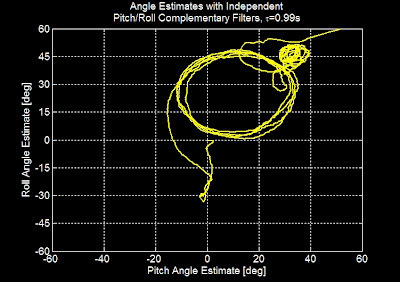 Sorry can't see why the yaw rate contribution onto pitch and roll is proportional to the reciprocal axis measured in radians. Why for small angles this is acceptable? Probably I am missing some basic consideration, if you knew any source that would explain that in more depth (don't mind if maths are involved) would appreciate it. As a test case, imagine pitching up by an angle theta and then yawing at a fixed rate omega. The rate of roll (defined with respect to the horizon) is omega*sin(theta). If you were to pitch up 90deg, the yaw rate would be equal to the roll rate, since sin(theta) = 1. For small angles, the approximation to sin(theta) is just theta, in radians. www.HefnyCopter.net ... I had some problems with stabilization and your articles helped me alot. could u share ur IMU.ino so that I can run it on my wii board. but I'm curious what the method you do to "yaw decouplling"? first let me tell that I really enjoy your great work, and your balance filter white paper in particular. 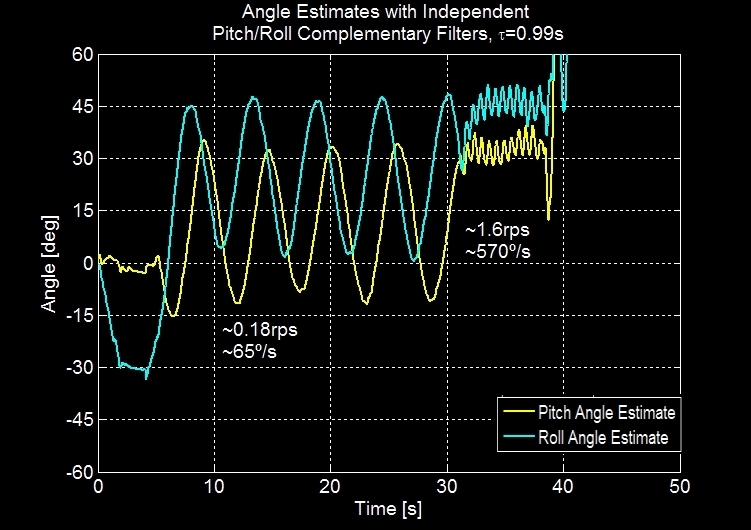 where the (gyro_angle - previous_gyro_angle) is the highpass filter. 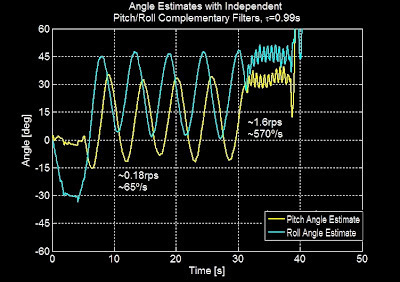 Obviously, gyro_angle - previous_gyro_angle = gyro_rate*dt, and you rederive your balance filter. Now, the highpass part, because of its x(n)-x(n-1) structure, would indeed remove a constant bias on the measured angle, exactly as expected. However, we don't have a bias on the angle, but on the rate, which is hence not filtered! Alternatively you may say that difference equations or H(z) functions do not comute as H(s) functions do. The balance filter is doing very well in judging which angle-estimate to trust better, but IMHO it doesn't remove or account for gyro drift. I can't see a mistake in the argument, hence I am forced to conclude that something must have went wrong with your data plots, that something done where is not exactly consistent with the balance filter concept as outlined here. - the proof of equivalence of #2 to the others can be done in three lines: expand filtered_angle equation, sort terms with "unwanted" variables to e.g. the left, and the time-back-shifted part is directly recognized. 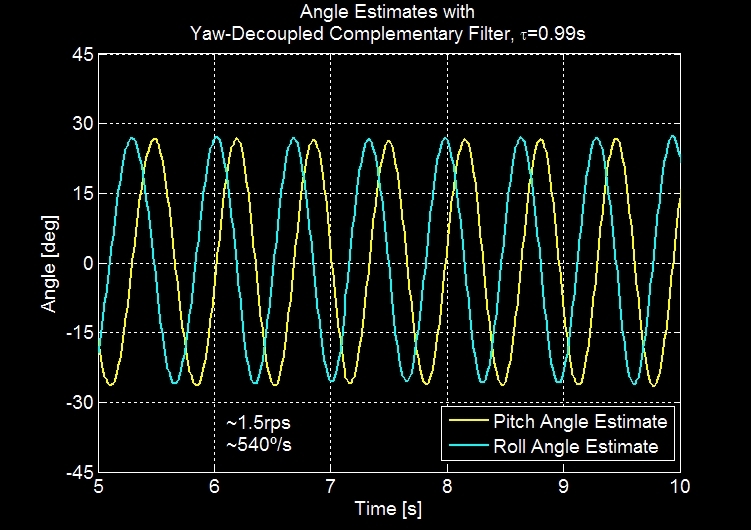 The complementary filter turns gyro rate bias into a constant angle offset with a value equal to the rate bias multiplied by the time constant of the filter. I mentioned this briefly in the white paper, but it's an important point. I'd much rather have a constant angular offset than an accumulating drift which is the rate offset integrated over time. 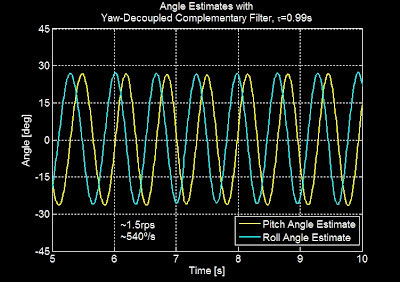 If you want less offset, you can use a shorter time constant on the filter - but then it is more susceptible to horizontal acceleration. A more complete solution is to also estimate the gyro bias, which itself might change over time, such as in: http://blog.tkjelectronics.dk/2012/09/a-practical-approach-to-kalman-filter-and-how-to-implement-it/. 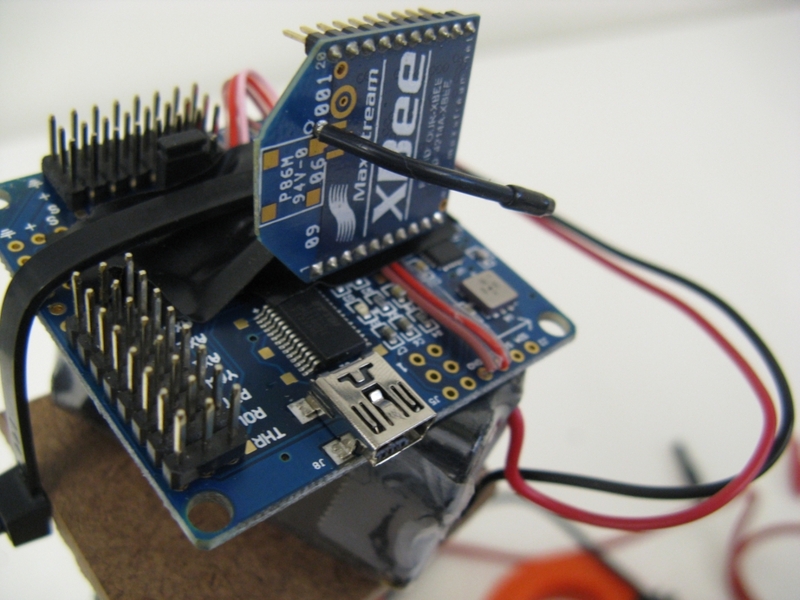 Just thought you might like to know... the signal pin for AX2 and AX3 correspond to the TX and RX pins on the 328P chip - No annoying soldering required! Great work! This is what I need now. If you are rolled right (+) and yawing anticlockwise (+), pitch will be trending towards backward (-). So yes I think you're right! Can you please share IMU code? Awsome work, I really like your idea of letting the yaw rate have an impact on roll and pitch by that overcoming the problem you describe. But I think there is an even cleaner solution: You have to tranform the angular rates measured by the gyroscope from the quadcopter's body frame into the earth frame with a vector-matrix operation. 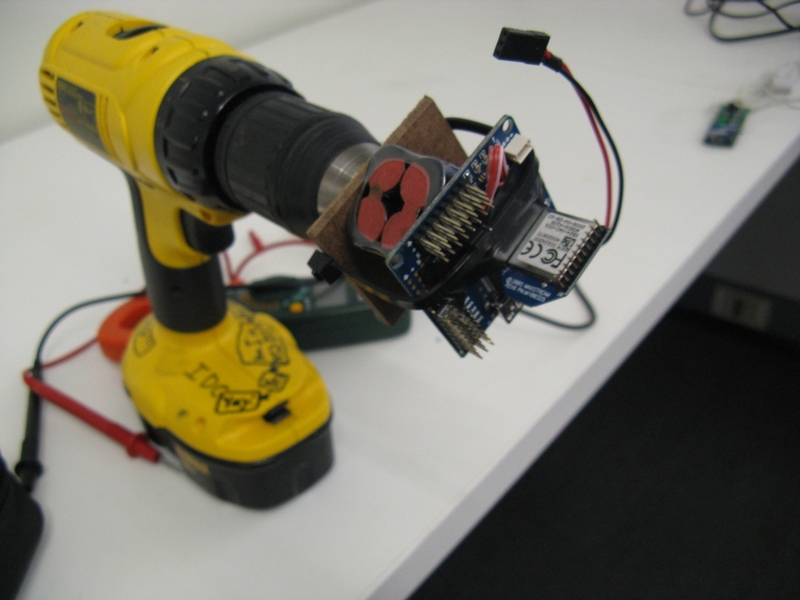 These transformed rates will recognize roll and pitch rates of an inclined quadcopter even if the quadcopter's gyroscope measures a yaw rate only. 1) I assume you have a good estimation of RPY (in the earth frame of course). 2) Get accelerometer data and calculate RPY_accel. This estimation will not be exact unless gravity is the only force. 3) Get gyroscope rates RPY_body_frame. Transform these rates with RPY from point 1) into new and rates RPY_earth_frame. 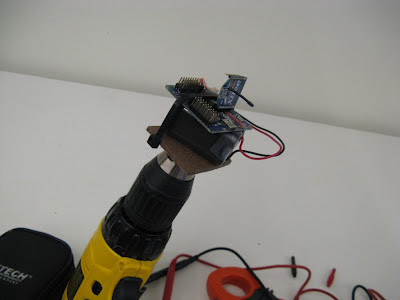 4) sensor fusion: RPY = a*(RPY + RPY_earth_frame*dt) + (1-a)*RPY_accel. 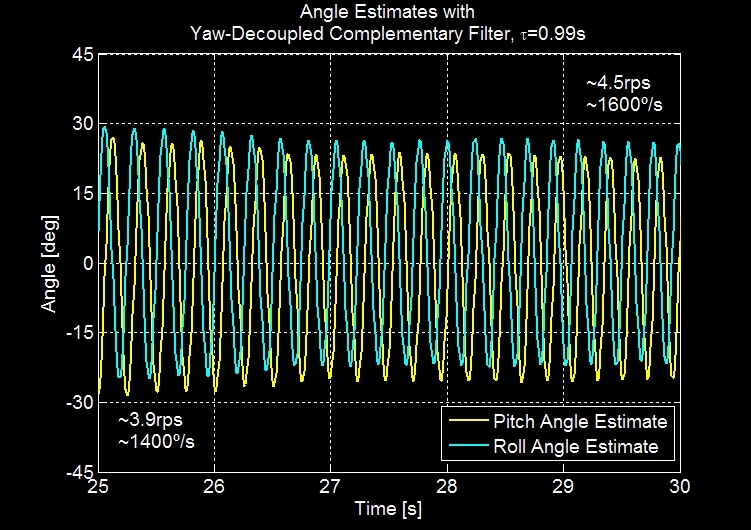 RPY is now your updated good estimation of roll, pitch and yaw. I think the transformation of the gyroscope rates from the body frame into the earth frame is crucial. Without it, you don't really use the rates of roll, pitch and yaw because the gyroscope does NOT provide them. It provides rates in it's body frame. Most quadcopter's do fly though. Rates in body and earth frame are the same if only one angular rate of RPY is nonzero and they are very similiar if the angles are small. What do you think about my idea? I wonder why most solutions on the internet ignore this transformation. 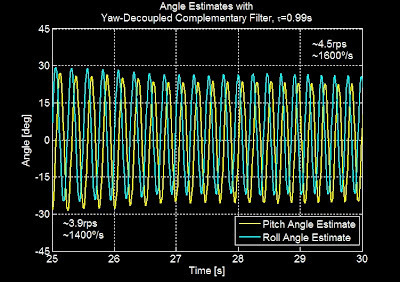 I guess I didn't think of it because I was trying to solve yaw coupling specifically, as it most dramatically effects control performance in small angle. (You can yaw integrate into a broken attitude estimate very easily. Pitch integrating can only go so far before you've hit an angle limit. But I can definitely see where the extra decoupling terms would be necessary for stunt flying. At that point I might switch to quaternion representation for the integration though. Another interesting question is what variables to use in the control loops and how to integrate the joystick movement into a target Euler angle. If you're in heading lock mode you might say rudder stick slews the target Euler yaw. But if you are in rate mode you would be commanding body rate. Not that that takes away from the desire to have an accurate attitude estimate in Euler angles - just makes it interesting how to integrate the joysticks onto a target in that frame.